For a full description see Kermode's 1917 article. 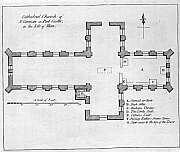 An 18th description is given by Grose in 1787 - includes a plan of the cathedral. The photograph shows the view from the southeast. The history of the decay of this Cathedral illustrates the power struggle between church (i.e. the Bishop) and State (i.e. the Governor) during the late 16th and 17th centuries. There was a scheme to restore the cathedral in the 1870's and plans were drawn up by Anderson to this effect but no money was forthcoming. 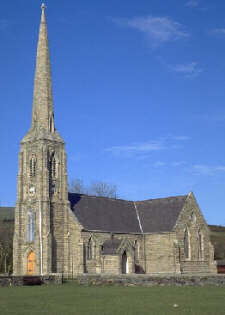 Built between 1879 and 1884 at the instigation of Bishop Rowley Hill to replace the old St. Peters in the Market place, Peel, which served as parish church for German (and until 1714 Patrick). 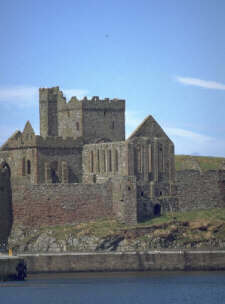 Became the Cathedral church in 1980 after several attempts to restore the ruined cathedral on St. Patrick's isle came to naught. Roof blown off in hurricane of 1903. Originally had a spire which had to be removed following subsidence in 1907. The church has a full complement of stained glass windows (gift of late W.H.Collister) of which those in the chancel depict various saints to whom ancient parish churches of the Island are dedicated. The previous church at St Johns was cruciform in shape. 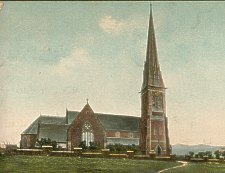 A Chapelry Church built 1852 due to exertions of Mrs Cecil Hall, widow of Archdeacon Hall.